Located in Marco Island, this vacation home is a 5-minute drive from Marco Island Historical Museum and 5 minutes from Mackle Park. With a stay at this vacation home in Marco Island, you'll be within a 15-minute walk of Jane Hittler Park and Esplanade Shoppes. Free self parking is available onsite. With a stay at this condo in Marco Island, you'll be a 2-minute walk from Pelican Pier Marina and 14 minutes by foot from Rose Marina. With a stay at this vacation home in Marco Island, you'll be within a 15-minute walk of Marco Island Historical Museum and Mackle Park. Located in Marco Island, this vacation home is within a 15-minute walk of Rookery Bay National Estuarine Research Reserve and Kice Island. 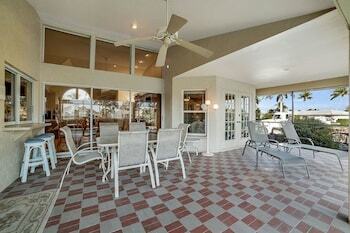 Located in Marco Island, this vacation home is within a 15-minute walk of Tigertail Beach and Jane Hittler Park. With a stay at this condo in Marco Island, you'll be a 4-minute walk from South Marco Beach and within a 5-minute drive of Marco Island Historical Museum.